A unique exhibition opened last week at the RIBA in London that compares schemes from two of the most iconic architects of the 20th Century: Mies van der Rohe and James Stirling. 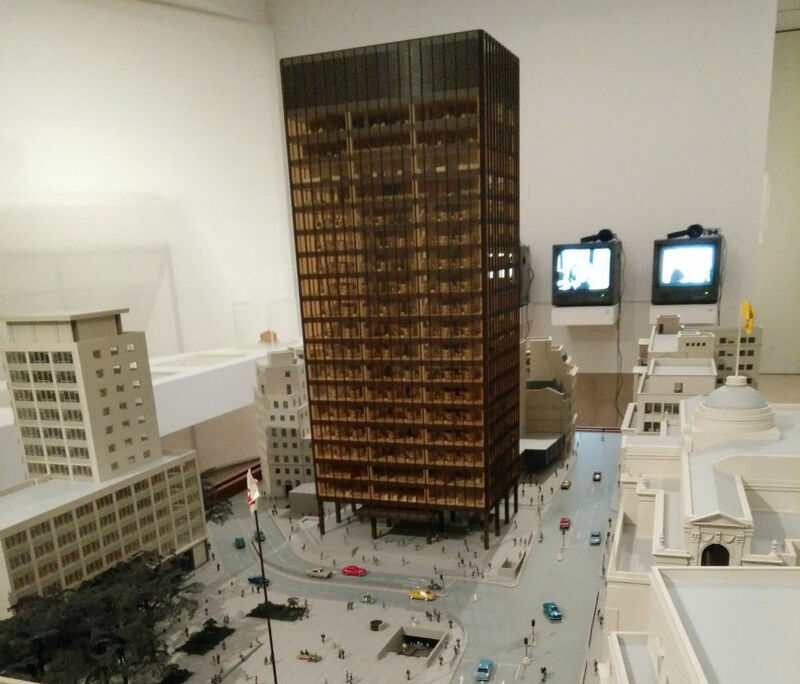 The exhibition, titled Mies van der Rohe & James Stirling: Circling the Square, takes a look at the unrealized Mansion House Square proposal by the former that was succeeded 20 years later by James Stirling’s newly listed No. 1 Poultry scheme. Sited in central London, Mies’s modernist proposal (a stylistic antonym of what was actually erected) drew ire from the public and monarchy, though the story, up until now, has likely been a mystery to those not old enough to know of its existence. The exhibition is the first time the public has been able to compare and contrast the two architects’ responses to a tricky site. The curators of the exhibition—Marie Bak Mortensen, head of exhibitions and Vicky Wilson, assistant curator, RIBA—have spent the last two-and-half years researching and sourcing a vast collection of photography, drawings, models, articles, and artifacts. Speaking to The Architect’s Newspaper, they said their motivation behind the exhibition was to “dig behind the official story,” fraught with controversy and public opinion, to expose the architecture beneath. Mortensen and Wilson, the original designers of the RIBA architecture gallery, have returned to design an exhibition consisting of steel, stained wood, and floating tables. 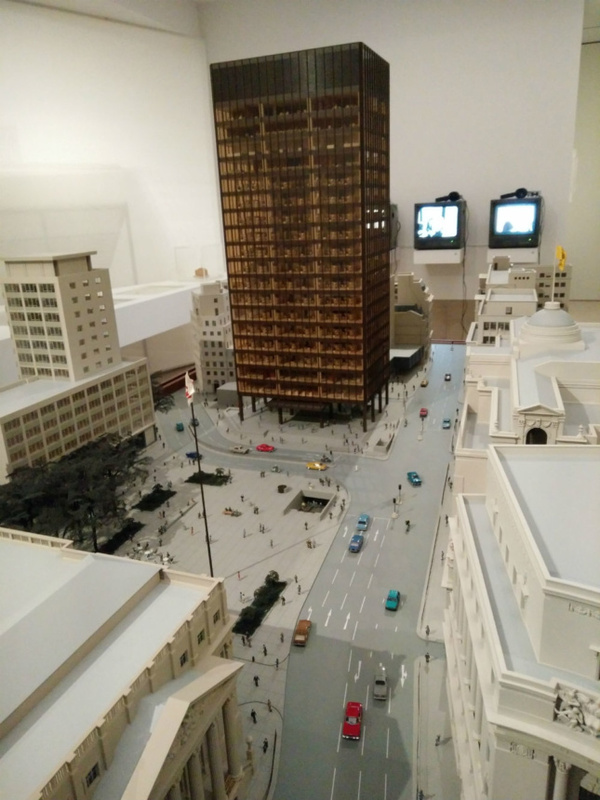 A 1:96 scale model of the Mansion House scheme dominates the exhibition, which was used as a marketing tool to impress the public ten years after the passing of Mies himself. 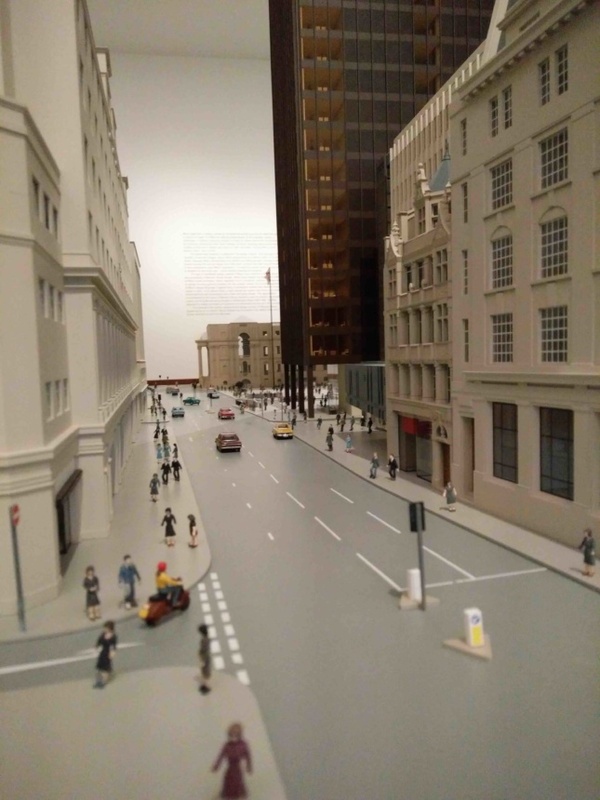 The highly detailed model of a proposal which was once dubbed a “glass stump” by Prince Charles, has been restored back its former glory. During its ascension into the public mainframe, the focal point of opposition to the scheme did not pertain to the scale of the 18 story tower of glass and bronze, but rather the vast public space proposed beneath and around. It is a public space which would be cherished today, yet in the 1960s it was seen as space which could incite unrest—a notion particularly toxic amid the wave of IRA terrorism in the UK. Circling the Square tells the story of the tumultuous 40-year journey of the site, culminating in the completion of No. 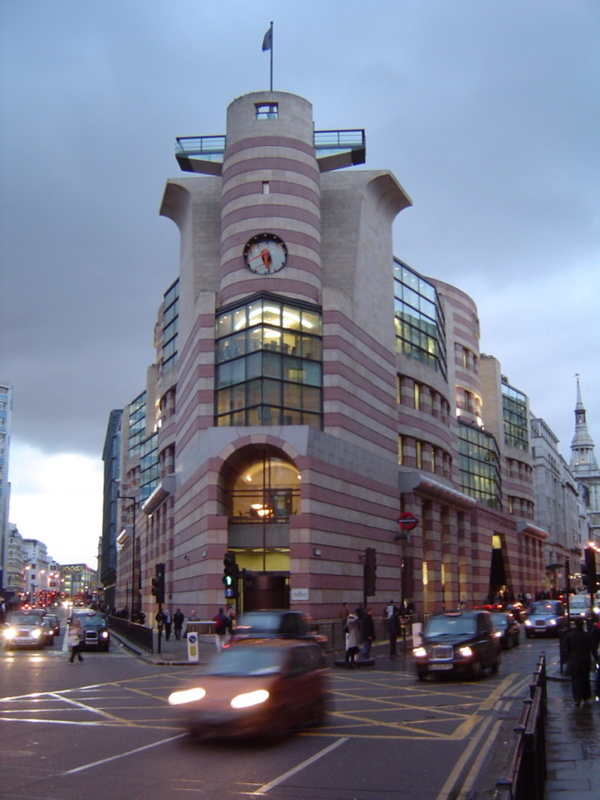 1 Poultry which went up in 1997, five years after Stirling’s death. Mies van der Rohe & James Stirling: Circling the Square runs through June 25 and is on show at The Architecture Gallery, RIBA, 66 Portland Place, London. James Stirling’s postmodernist No. 1 Poultry is a stark contrast in style to Mies’ proposal.